How did you guys get into the beer brewing business? Beer has always been something that we enjoyed. Growing up we used to drink beer in Kiyo’s house. I even think that it was in one of these sessions that the drunken promise to make our own beer came up. We finally decided to try to brew our own beer back in 2010. Raffy got a simple book on how to brew called Beer Craft. Brett was working in Singapore at the time and there was a homebrew shop there that provided us with the ingredients needed for a small batch. 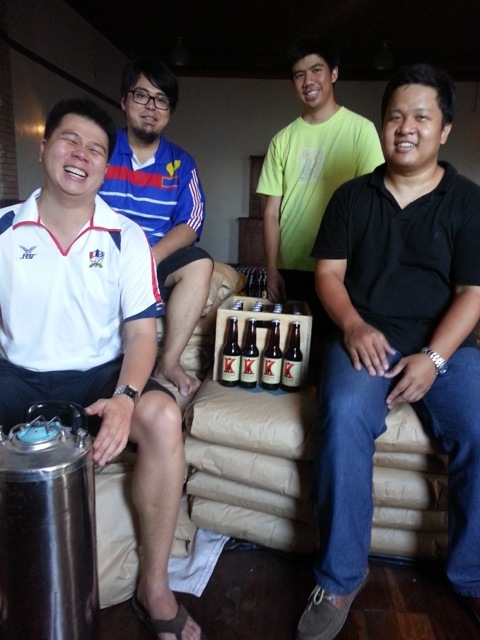 We brewed our first batch in Kiyo’s kitchen. Our first brew yielded us 4 small bottles. It wasn’t great beer by definition but it was definitely the best beer we had ever had. It was our beer. We would then bring those bottles to parties and gatherings and would have people comment on our creation. After a few batches we knew we had a product and decided to try to bring it to a proper event in a proper bar. Borough was nice enough to let us sell one case of beer at their Fourth of July event. We were able to one case. Since then we have been steadily been scaling up, expanding distribution and improving operations. We are still a very small brewery by industry standards, but we are always looking for ways to increase production and get more beer out there for people to try. We have always been a bit offbeat. We have always found interest in things that were a bit different. In the team we are big fans of European football, Stand-up comedy and Indie music. I think this interest in the different has also influenced the way we like our beer. When it comes to people and their influence on the business we have always looked west to how the craft beer boom happened in the US. Sam Calagione of Dogfish Head Brewery used to have a show called Brew Maters; about how he would make some really creative brews. We also all read Beer School – a book about how the founders of Brooklyn Brewery got started. It is always great to know that the beginning will be tough but it will all payout in the end. Locally, we look up to Jim Araneta of Global Beer Exchange. He was the guy that started the whole craft beer revolution in the country. He tells us of how tough it was in the beginning. We love to see his passion and how he has been able to change the way people see beer in the Philippines. Katipunan Indio Pale Ale is considered a craft beer. Please explain to our readers what a craft beer is? Are there specific criterias? This simply means that a craft beer is small in terms of their production capability, independent of ownership from big beer brands and has a beer that uses all malt. But technical definitions are just used for labeling. A craft beer is really about a beer bringing more of the art and attention to its flavor. What are your favorite bars (foreign or local) at the moment? Of course we love every bar that carries us – Route 196, Sa Kanto, The Bottle Shop. Kiyo frequents Boho Sarapsody Bistro in Quezon City. Raffy used to do open mic at Tomato Kick on Katipunan every Tuesday with the rest of the Comedy Cartel. Please tell us what your favorite beers are? Of course the best beer in the world is the Katipunan Craft Indio Pale Ale. Another favorite was the limited release of Signal No.1 Stout that was released last year. It was a nice chocolately-coffee stout. We may make that one again sometime. I recently tried two beers that I really liked – Dogfish Head 120 Minute IPA and the Brooklyn Brewery Dark Chocolate Stout. The Dogfish Head 120 Minute IPA is a 15-20% ABV beer. It is a strong beer but it is not offensive. The Dark Chocolate Stout is a nice creamy Russian Imperial Stout that feels like a boozy milkshake. Manila has so many new up and coming restaurants that it is hard to choose. For Japanese food we like Yabu: House of Katsu. It is located not too far from the brewery so it is always a nice treat to have a properly prepared kastu after a long day of work. Gino’s Brick Oven Pizza has a host of good pastas and pizzas. We love to put their spicy honey on everything. Mang Juan’s Chicharon is a favorite in the brewery. I remember there being a stack of Honey Mustard Pringles around the office before. Those were good. Kettle Korn is also a good snack we love to munch on. We’re a pretty adventurous bunch. I think we can try everything at least once. I guess enjoying might be another thing. When we were backpacking in Australia before, we used to save as much as we could then hit buffets when we had enough. One buffet though required we have a gnocchi dish as part of our order. The gnocchi was good but it was so heavy. In the end we didn’t get our money’s worth at that buffet because the gnocchi just filled us up. I’d say gnocchi would be the closest thing just because it is so dense and heavy. We are constantly looking for ways to improve – improve our product, improve our operations, improve our sourcing. We are trying to get more beer out there. One consistent complaint from people is that the beer is never there when they want it. We are also looking to going into kegs. Kegs will help us get fresher beer to more people. We will definitely be releasing more limited edition beers. We’ll continue to try new things. We’ll try to get the beer to be more Filipino if possible – with Filipino ingredients and maybe even yeasts. 17 Gilmore Ave. cor. 1st St.
New Manila,Quezon City, M. M.
Acropolis/Greenmeadows/Valle Verde 6/XaviervillePick-up/Delivery also available. Blue Ridge, Quezon City, M. M.
12 ADB Ave.Ortigas Center, Mandaluyong, M. M.
Thanks for the feature, Sanju & gang! Cheers to the KATIPUNEROS! Truly believed that your venture will be a great success...you are already on your way there!